First grade math students need daily number sense practice. 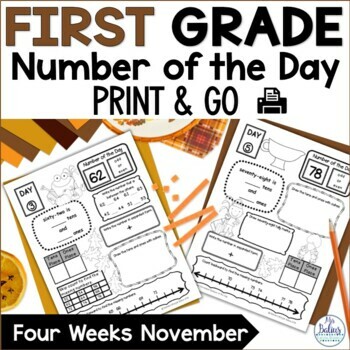 These printable, easy-to-use first grade Number of the Day activities are the perfect way to practice this important concept. Your kids will love them and will ask for more! Plus, they are great for morning work! First Grade Math, Number of the Day, Place Value Practice!! This unit gives your students a lot of practice working with numbers, representation and relationships. 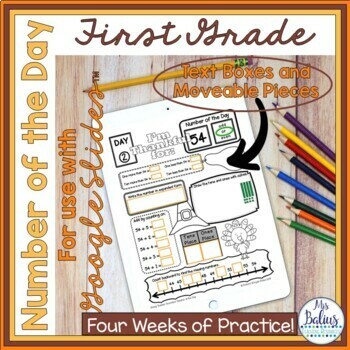 All students need daily practice working with numbers to effectively develop their number sense. This unit reviews number sense from the First Grade Common Core Math Curriculum and introduces the beginning of the First Grade Common Core Math Curriculum. 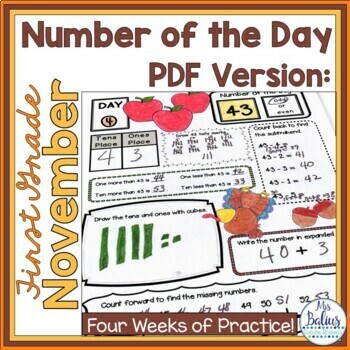 This unit is aligned with the First Grade Common Core Math Standards, and includes twenty days of practice with a November theme. The pages are divided into four sets of five with a cover page with blank and completed 120 charts. These pages can be used as a daily warm-up/spiral review, work for fast finishers, or for homework. I use ‘guided math’ in my classroom. I begin my teaching time block teaching/spiraling math concepts as a whole group, but most of my math block is devoted to guided practice in small groups followed by independent or small group practice, centers and intervention. I begin my math time every day with a page from my popular Number of the Day series. You may find more math in this “printable” format in my store. I hope that you and your kids enjoy this November resource. Check back soon. I continue to add Number of the Day units daily!